Perhaps you are renovating an old home, or you want to inject a room in a newer house with vintage charm? Choosing a vintage wallpaper is one of the easiest ways to give any room in the house an instant update, and there are lots of wallpapers on the market that replicate authentic, historic wallpapers and will fit in perfectly with a traditional room design. From flamboyant Victorian florals to minimalist and monochrome Mid-century designs from Scandinavia, we have picked vintage wallpapers that really stand out. If you will be changing the wallpaper as part of a larger decorating project, visit our design hub page for more inspiration and practical advice. And don't miss the chance to find out how to wallpaper a wall in our guide. Four of the designs featured in our vintage wallpaper design gallery were introduced to us by Abigail Edwards' first book, Quiet Pattern: Gentle Design for Interiors. The book introduces readers to the idea of home decorating in a way that's gentle and unobtrusive and includes some really beautiful historical wallpaper designs as examples. The book is available at Amazon. This Brodsworth Empress wallpaper from Little Greene has quite a history. The design dates from the Victorian era, with the original found at Brodsworth Hall in South Yorkshire, built between 1861 and 1863. But the design itself is based on early 18th century French textile design (the Victorians were known for reusing designs from past eras). The slightly raised wallpaper incorporates rich gilding detail. The wallpaper is used as part of a dining room design here. Browse more traditional dining room design ideas in our gallery. The rhombus wallpaper design was one of the most enduringly popular geometric wallpaper designs in 19th century Scandinavia, both versatile and allowing for countless colour variations. 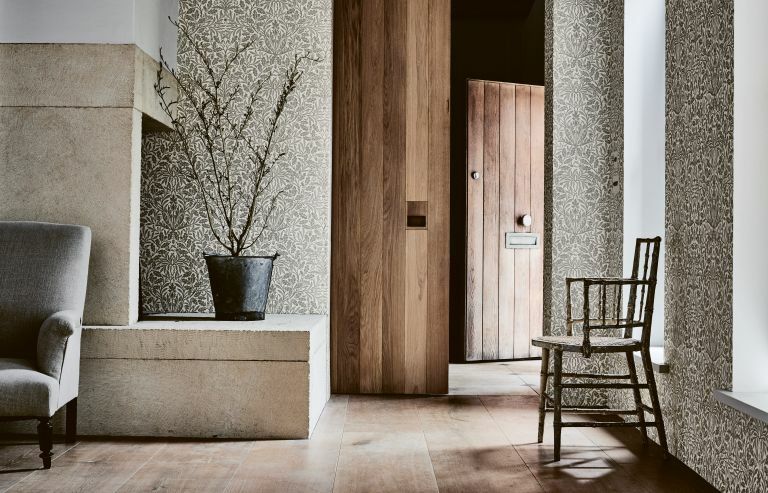 The Edvin wallpaper by Sandberg comes in four different colourways, and we think that this version is perfect for creating a moody and dramatic hallway. Browse our hallway wallpaper ideas for more inspiration, and don't miss our traditional hallway design ideas, too. The North End Road Mischief wallpaper is from west London, specifically from the home of a 20th century antique dealer. The wallpaper design itself is from around 1840. Lincrusta wallpaper is one of the Victorians' great gifts to home decor; a deeply embossed design, it was invented by Frederick Walton and launched in 1877, a year after he patented a Linoleum floor covering. Lincrusta is tough and durable and is even referred to as 'Linoleum for the walls'. It was immediately taken up by everyone from the royals to railway carriage manufacturers. Lincrusta creates a sumptuous, textured look and feel and is a popular choice for renovation and restoration projects. We have more bedroom wallpaper ideas for you to browse in our gallery, and don't miss our traditional bedroom design ideas. The VE1971 from The Victorian Emporium below is a Lincrusta design with a modern twist; the dusty rose colouring will look great in any bedroom. Bear in mind that putting up this wallpaper is a little more labour intensive due to its thickness. William Morris is perhaps the most famous British designer and the figure most closely associated with the Arts and Crafts movement. In a nutshell, the Arts and Crafts movement promoted going back to traditional craft techniques as opposed to industrialised production, and used medieval and folk motifs in its designs. Nature-inspired motifs were especially popular. The Acorn wallpaper is from 1879 and celebrates the English landscape. Available in several neutral colour schemes, it's a versatile option for a traditional living room. Browse more traditional living room design ideas in our gallery. Chinoiserie, the decorative style incorporating Chinese motifs and techniques, first took hold in Europe in the 18th century, but the second half of the 19th century saw a revival, with Chinese-inspired homeware made and sold in all European countries. The China Rose wallpaper by Little Greene (c.1885) uses the motif from a late-19th century French hand-painted ‘Peking Stripe’ fabric with a distinct Chinese influence. This Swedish design dates back to the late 19th century, when medallion patterns in blue and white colour schemes became popular. The opulent design and confident colouring reflected Sweden's increasing economic prosperity, as did the imitation of textile and leather in the stripes. The Hildastro wallpaper is available from Sandberg. Edwarn Bawden (1903-1989) was a British artist who trained under Paul Nash and painted, among other things, the war effort in Europe and the Middle East. He also designed ceramics and posters, like many other artists who were blurring the boundaries between applied arts and fine arts during the first half of the 20th century. The Seaweed wallpaper was designed in 1927 and has been relaunched by St Jude's as part of their Studio Archive range. Mid-20th century designer Viola Gråsten was renowned for her colourful geometric textiles designs, but this wallpaper design is more understated and based on a 1964 sketch. With Scandinavian design remaining a popular choice for contemporary decorating schemes, the monochrome wallpaper is a great choice for any room in the home. The Borastapeter Romans Wallpaper is available from John Lewis. Another mid-20th century design, the playful Monkeys and Birds wallpaper was designed by Sheila Robinson in 1958. The artist was associated with the Great Bardfield Artists and worked at the Royal Academy of Arts. The rose and grey parma colour is the original design, but St Jude's have also added two other colour options.